This is the story and message that we sense we are to continue to tell. Therefore our burden for this year is “Serving the Purpose of God in our Generation”. If we serve this purpose faithfully as individual believers and believers gathered together in the Assembly, we are convinced we will know a life well-lived. For those that have been coming for years and those many new ones that have been coming in recent years, we believe there is no more important message. In the end we all want our testimony to be the same as the Apostle Paul’s, “I was not disobedient to the heavenly vision” (Acts 26:19). To do this we believe that it is important that we go back to the beginning with an understanding of His purpose, who are we and why do we so gather. To help communicate this burden we have asked our brothers Stephen Kaung, Dana Congdon and Lucio Aguirre to be responsible for the ministry of the word to us. Please remain in prayer that God’s full purpose for the conference will be accomplished. The sessions for high school age teens will be coordinated by brethren from Manhattan, NY. The children's ministry this year will focus on the life of the David. The conference will be held at Longwood University in Farmville Virginia. Farmville is a small town about 1 hour southwest of Richmond. The closest airport to Farmville is the Richmond International Airport (RIC). A campus map of Longwood University can be found here. Longwood has graciously made many facilities available to the conference including classrooms, recreational facilities, sports fields, dormitory space and meeting rooms. A central walkway (or spine) runs the length of the campus and most of the buildings are organized around that spine. The central spine contains several fountains including a walk-through/play-in fountain. The ministry meetings will be held in Jarman Hall (Building 14). The dormitories used by the conference are Cox (Building 18), Wheeler (Building 17), Register (33), Sharp (33), Stubbs (33) and ARC Residence Hall (Building 33). Meals will be served in Dorrill Dining Hall (Building 28). Due to limited class sizes this year those with children need to register early. Although the conference capacity is 600 on campus, we only have classroom space for 200 children, nursery through 8th grade. Therefore, family registrations should not be delayed. Registrations with adults only, singles and families without children will be left open until capacity is reached. The maximum registrant capacity this year is 600 on campus and 200 off campus. Any persons, including all children, who will be attending conference meetings, day and/or evening, but not staying on campus MUST REGISTER. A registration/commuter fee of $50 per person ($150 per family maximum) is required to help pay for rental of the facilities and can be paid by mail or online by credit card. It is necessary that you register so proper arrangements can be made for you and your family for nurseries, children's classes, crafts, group meetings, etc. Please check the box pertaining to Off-Campus Registration on your Registration Form. If you would like to take your meals at the dining hall while staying off-campus, please check the box marked "meals" on the Registration Form. 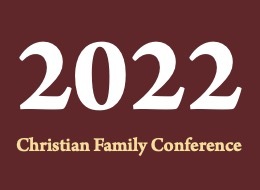 Please be advised that the Christian Family Conference is absolutely unable to sponsor any visas for individuals desiring to attend the conference.